Why does Genetic Engineering call himself Synthetic Biology? One day Genetic Engineering started calling himself Synthetic Biology. It was weird, but I let Genetic Engineering do it because he is an angsty teenager with something to prove to the world. But then everybody started calling Genetic Engineering by his nom de Pubmed—Synthetic Biology. Even people who have known Genetic Engineering since the 80s started calling him this. Everybody knows who Genetic Engineering is. Nobody can tell you (or at least nobody can agree on) who Synthetic Biology is because he doesn’t exist. 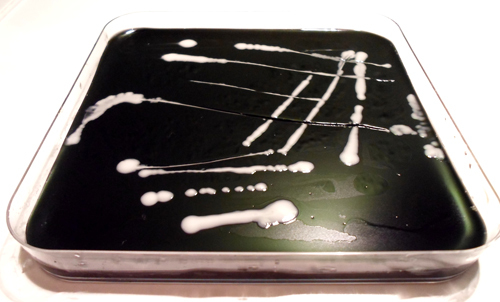 Black agar allows the yeast to fully comprehend the futility of its existence. Somehow Genetic Engineering thinks that just because he is now “applying engineering principles” to biology (what do you think he was doing before? ), or getting codon optimized DNA synthesized, that he is all of a sudden doing something totally different. Let me be the one to tell you. He isn’t. Genetic Engineering is on the same trajectory he has always been on. He’s just learned a few new tricks he is inordinately proud of. Genetic Engineering has always been learning things from his buddies Molecular Biology and Biochemistry, then rationally designing and testing novel biological systems to introduce new functions in living organisms. Remember back in the 70s and early 80s when Molecular Biology told him all that stuff about promoters and what a lactamase is good for? Genetic Engineering used that information to make a whole bunch of cloning plasmids with antibiotic selectable markers, and he threw in a pretty sweet multiple cloning site too. Then, after Biochemistry figured out how to make DNA in a cell-free system by adding polymerase, a pinch of nucleotides, and some temperature cycles (That was so totally like Biochemistry to invent that)– Genetic Engineering was on a roll and to this day is still exploring the applications of this technology. Could we do this without synthetic biology? Well…yes. This picture was taken in 1986. Genetic Engineering has so much lot to be proud of – he’s made some huge advancements – but now he’s hiding behind this new name. Rather than rtPCRing off of some mRNA to grab a gene, he’s calling up a DNA synthesis company and getting codon-optimized genes mailed to him—and calling himself Synthetic Biology. Now that Molecular Biology has given him a whole palette of characterized promoters and repressors, Genetic Engineering is making a toggle switch—and calling himself Synthetic Biology. Now that Biochemistry has learned so much more about protein folding that he can create novel enzymatic activities, Genetic Engineering is popping these genes into a pathway—and calling himself Synthetic Biology. What’s fundamentally different about what Genetic Engineering is doing today and what Genetic Engineering was doing 10 or 20 years ago? There are more pieces involved now, and the supporting technologies are better, but it’s essentially the same thing. Genetic Engineering is growing up, and he doesn’t need to call himself something different just because he has some new toys. So lets all agree to call Genetic Engineering by his real name, and not this contrived nonsensical name. Take off that mascara too. You look ridiculous. …valid points Nikolai. Good luck with your business and interesting science behind it. I wish you success in your venture and hope that revolution bioengineering will lead plant science out of the dark GMO age. Thanks Resmi! It’s been a while– Hope all is well with you!